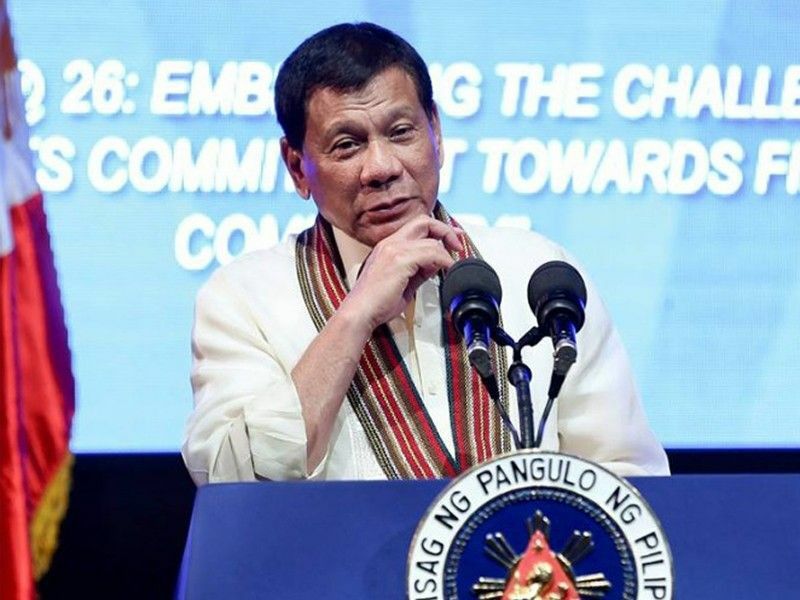 PRESIDENT Rodrigo Duterte slammed former Bacolod mayor Monico Puentevella on Thursday, March 21, for allegedly splicing his video during the campaign rally of the Partido Demokratiko Pilipino-Lakasng Bayan at the Victorias City Coliseum on March 8. In a video posted on Duterte’s official Facebook page Thursday, Duterte said that he does not want his name dragged into lies. “I do not want something that is a fraud,” said Duterte. “Nung sinabi ko ‘yong sa droga, when I rattled off the names, I never mentioned the name of Mayor (Evelio) Leonardia. I just mentioned the names and sinabiko, ‘Mayor, diba nandoon ka?’ I was referring to a previous meeting dito sa opisina ko (in Malacañang), pinatawag ko lahat ng mga city mayors,” Duterte said. “Ang sabi ni Monico na pinangalanan ko si Leonardia as one of the (narco-politicians), ‘di po totoo ‘yun. It was purposely and intentionally—binaliktad yung salita at hindi naman fair yan. My advice kay Monico is that ‘Huwag ganoon.’ Gagamitin ang pangalan ko, tapos ang mga speeches ko ini-splice niyo, dinagdagan niyo, pinag halo-halo niyo, lalabas na si Leonardia ang nasa droga. Mali po‘yon,” he said. Duterte was referring to an edited video shared on social media of him reportedly naming Leonardia as among the mayors involved in illegal drugs. Puentevella, who is running for congressman, earlier criticized Leonardia, saying that Bacolod is now in trouble and that he is the city’s problem. But as Duterte released his narco-list last March 14, which named 46 local officials allegedly involved in illegal drug trade, none of them were from Negros Occidental. “Si Monico wala, neither pangalan ni Leonardia. I would like to tell the... mga taga Bacolod, wala akong sinabit na mayor dyan (Neither Monico and Leonardia are on the narco-list. I would like to tell the people in Bacolod that no mayor was implicated in the list),” Duterte clarified. SunStar Bacolod reached out to Puentevella last night in order to get his comment regarding Duterte’s statements against him. The former mayor, though, is yet to reply as of press time. As Duterte continued to make his clarification, he let slip that he wants Leonardia to lead Bacolod City. “But, kung tanungin n’yo kung sino para sa akin ang... I do not want a guy making a fraud sa lahat ng sinabi ko (If you ask me who I think is... I do not want a guy making a fraud out of what I say. I am supporting Leonardia for the mayorship of Bacolod City). I am supporting Leonardia for the mayorship of Bacolod City. I think he is the better guy, who is more direct and honest. Siya ang gusto kung maging mayor (He’s the one I want to become mayor). I am supporting him,” Duterte said. For his part, Leonardia said he is thankful that Duterte made the clarification. “This, once again, shows another dark side of the character of Puentevella. He is a rare specie who believes in his own lies,” he said. Leonardia also expressed his gratitude to Duterte for endorsing him in the May elections. “For me, it’s a big thing as well as for Grupo Progreso,” Leonardia said. Leonardia added that they will still file the criminal charges against Puentevella and his two sons for allegedly tampering with the video of President Duterte.